It’s been awhile since I’ve written about blogging, and it seems only fair to share My Sardinian Life’s All-Time Stats, from the beginning of time. Why do I think it’s important to share my blog stats with the world? Because most bloggers are secretly obsessed with their stats, and I think too many bloggers focus on the numbers and not the content they write. I want to show newbies to the blogging world, that it takes time. Patience is definitely a virtue. The most important question to ask yourself: Am I blogging for fame, money or prestige? Or, am I blogging for me, because I love to write? I blog, I write, for me. Words are my art, a story is my foundation. November 17, 2010 was my first blog post. I had expected the stats to go through roof, they didn’t. They barely scraped the surface, a little bump in the far off distance. This is the all-time monthly hits provided by WordPress, I know many of you are already familiar with it, but this is for total blogging beginners. All-Time Monthly Hits starting: November 17, 2010 and ends on March 27, 2012. There’s a huge spike in numbers for March 2012. I joined The Weekly Photo Challenge put on by WordPress. I joined the weekly challenge because I enjoy taking photos and I enjoy learning on how to improve my style. I’ve learned a lot from great people in the last few months. Thank you! These are all-time numbers, folks! Many of you want shirtless Italian soccer players! I know, right? Hot! Let me do you all a favor: Top 7 Shirtless Italian Soccer Players. Which leads me into the next stat category. Rossella Urru – the 30-year-old Sardinian woman being held hostage in Algeria. It’s sad that we even have to search her name. A silenced media breeds only ignorance. Freedom for Rossella. Life before the internet was searched fifty-one times! It’s nice to see that I’m not the only one trying to remember a time before technology robbed us of reality. Twenty-eight times, someone, somewhere in the world entered in my pen name: Jennifer Avventura. A pen name it is, yes. Jennifer is my birth name. Avventura comes from a childhood street, my Italian studies, and my travel adventures. An Open Letter to My 85 Followers was an attempt to make a little money. I wasn’t asking my followers for money! I thought I could add AdSense and other widgets to make some extra cash. Boy, was I wrong. Unless you pay to have your own domain, your own little www, you cannot make extra income. I am not at the point where I want to fully own a www. After a year and a half, I am still learning. But the time may come when I do acquire one. What is One Countries Culture is Another’s Taboo | Horse Meat is a very recent article and people have a lot to say about horse meat. What is your take? I learned how to cook in Sardinia. Before, I didn’t have the patience nor desire to cook anything. I thought lasagna was something the fairy food mothers created and thought the feat impossible. Now, I love to cook and experiment in the kitchen daily. 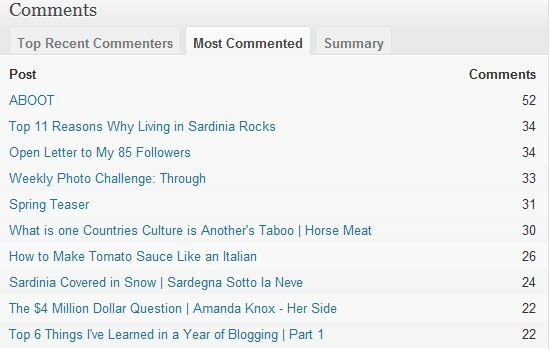 Twenty-six of you commented on How to Make Tomato Sauce Like an Italian. Thanks for the great tips in the comment section, I’ve recently learned a few, new tricks of the trade! Spain is literally a hop, skip and a jump from Sardinia. I wonder why so many Spanish people are interested in Sardinia. If you are from Spain and reading this … can you please let me know what you find so fascinating about Sardinia. It’s awesome to see my home and native land, Canada in the top 5, eh! Thanks Canada! I know Sardinia is a long way away, but we welcome you with open arms. My Sardinian Life has been awarded several blogging awards: The Versatile Blogger Award x4, The Awesome Blog Content Award, and The Liebster Blog Award. 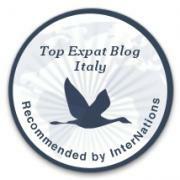 It’s a wonderful feeling to be recognized by other great bloggers, I thank you all. So that about wraps up my stat fest. Where you alarmed at the low numbers, after a year and a half of blogging? I blog because I love to write, and I have a story to tell. Clearly Photo Challenges are the way to go! Unfortunately, I just do not have the time. Well done on the increase! I love the post! How did you do the screen shots? I am with you that the most important reason for writing my blog is for having a voice and the thrill of writing and sharing stories. It does get hard to not obsess over stats and whether or not people like your log. But at the end of the day the real thing that matters is how much joy writing and publishing your work brings you. Great thoughtful post Jennifer! Generally I need to go outside once I’ve hit publish. I feel all school girl-ish, sometimes silly. The screen shots I used a toold called ‘snipping tool,’ I have windows 7. I agree with you and Debra. Those that agonize over numbers and feel like giving up because they didn’t have any hits that day… they miss the whole point of blogging. Congrats on your numbers though!!! Those are numbers to be so very impressed from!!!!!! My blog has grown slowly but steadily over the last 2 and a bit years. Being Freshly Pressed twice caused a couple of blips on the radar and encouraged new followers, but being obsessed with stats is not a good thing, blogging should be fun and I can see that you enjoy what you are doing….it shows in your posts. Keep on blogging. Thanks Debra. You’re right, blogging should be fun, agonizing over numbers is not. Like you, I’ve noticed a jump in numbers since I started doing the Weekly Photo Challenge, which I really enjoy. And I had more hits in January 2012 than the whole of 2011! Luckily, the numbers keep going up so I’m pleased with the progress I’ve made since I started seriously blogging in October 2011 instead of just tinkering occasionally.